Todber Manor is somewhere that gets a fair bit of press, whether it be from official angling publications or anglings blogs, and having read how good both the venue lakes and the tackle store are, I wanted to get out to Todber and have a look for myself. As the crow flies Todber isn’t that far from me, but the winding roads of Somerset and Dorset left my SatNav believing it was going to take me 57 minutes! Nonsense, and without speeding I made it in 39. I pulled into the complex, and parking right outside the store (which is open until 2.30 on a Sunday) I was very pleased with what I saw. Get ready to empty your wallets! The store itself is in an open plan style, with the till on the immediate left as you enter. 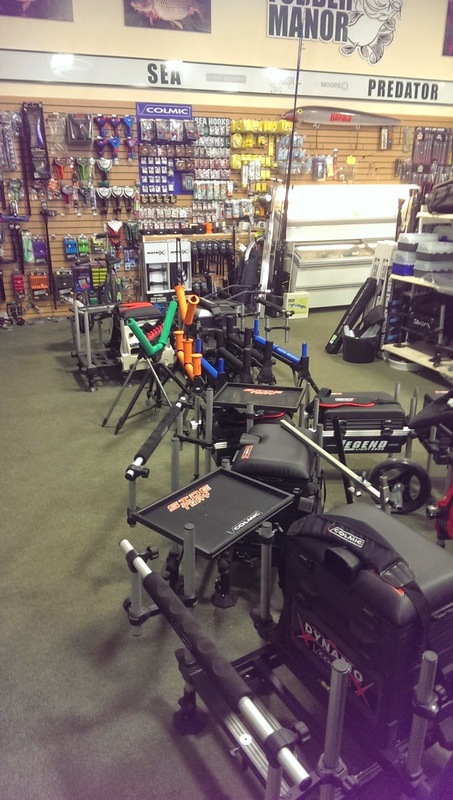 There are double sided aisles filling the floor space and there is a fairly large rack of rods on your right, but the main feature has to be the abundance of quality coarse fishing gear. 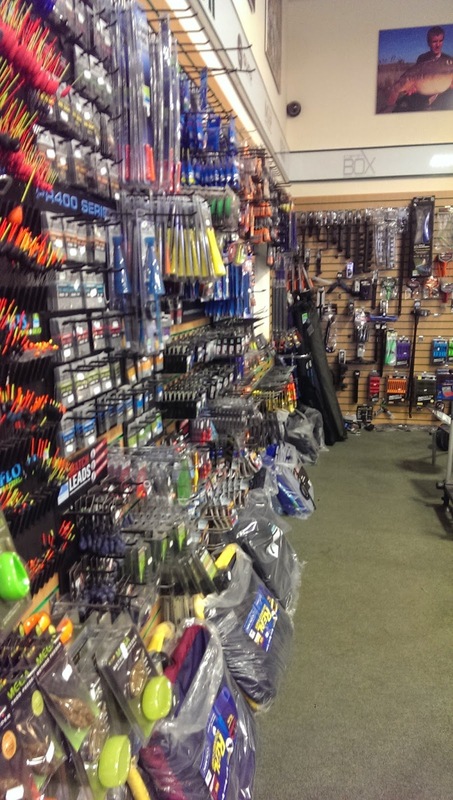 That said I was very keen to have a good look around, and walking down the left hand side of the store there is coarse fishing equipment galore, with more brands than you could shake a… pole at. There were several Colmic seat boxes set up, next to which there were numerous pole rollers and various tripods with pole roosts on. The left hand wall was absolutely covered in coarse fishing equipment and I could have spent ages looking through the various types of landing nets, keepnets, pole floats, swivels, leads, disgorgers, elastics, readymade rigs, readymade hooklengths and comparing brand to brand (of which Todber covers A LOT). There was a fairly extensive range of Guru, Fox, Preston, Colmic, Matrix and Drennan rig and tackle bits, which reminded me that I needed 2 new PTFE connectors for 2 of my top kits. The back wall continued the theme, and there is a large selection catapults, spray bars, feeder rests, side trays …. Pretty much every seat box attachment you could think of. It became very obviously that at Todber Manor they catered for every type of angler. The coarse fishing part of the back wall is broken up by a large freezer, housing a good selection of frozen boilies and other chilled baits (although I didn’t spend a great deal of time looking through it). This then makes way for the Predator and Specimen/Carp section which runs across the rest of the back wall and down the entire right hand side of the store. The Predator section ticked a lot of boxes too. At Todber you can fish for Catfish, so it seemed obvious that they had equipment there to cater for it. Along with the standard piking gear for deadbaiting – Floats, traces, trebles, everything you would need to get you off the mark and on the hunt for a winter Esox. The right hand wall had everything a carp angler would want or need. With large ranges of all the main brands, all out on the shop floor for you to have a good look at. There were rod pods, luggage, clothing, rig bits, alarms, all sorts! 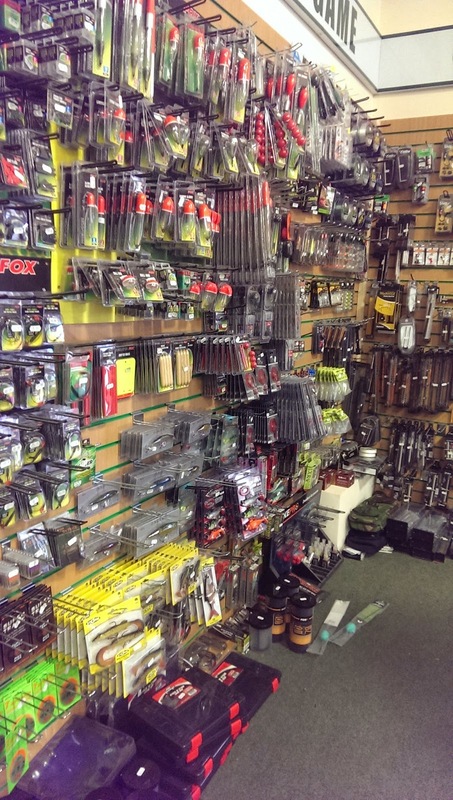 This tackle shop was turning out to be one of the best I have visited in the South West. It was also great to see a selection of rods, set up at full length, in store. You could actually pick them up and get a feel for the rod before buying, which always helps. So many options to choose! The aisle in the middle of the store was filled with ground bait, pellets, boilies, attractants and various other additives. I walked around desperately convincing myself that I didn’t need to buy at least 1 of everything. I could have spent a good hour in the store looking around and going through all the bits on the walls but there were fish that needed catching! I intended on spending the rest of my day on one of the 2 Whiteposts lakes, hoping the quality of the lakes matched the quality of the tackle store. I will say didn’t see many poles on site but then I wasn’t really looking for them. I also forgot to ask if they sold any fresh baits on site (as I already had a few pints of maggots in the car), but I wouldn’t be surprised if they did, especially with so many lakes on site, it was seems a bit nonsensical not to offer some fresh bait, after being able to provide all that fishing tackle. 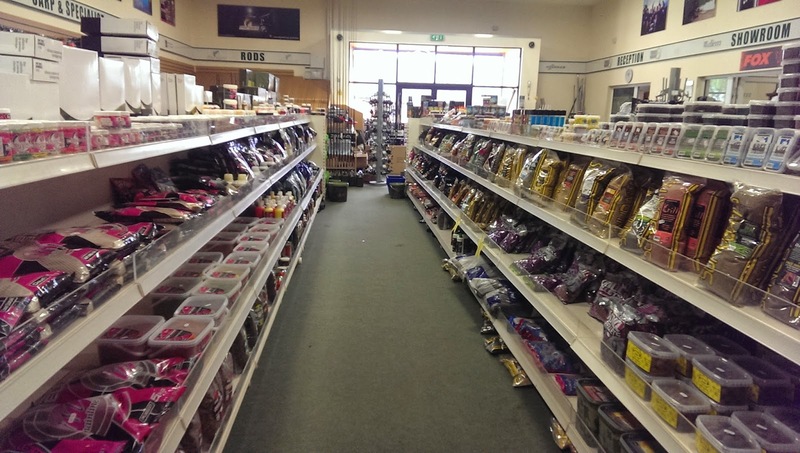 As with all big fishing tackle shops on fishing venue sites the prices were slightly over inflated (the same can be said for Cefn Mably), but then you are paying for convenience. As far as tackle shops go, it is great and you could go in there an unarmed novice and come out a professional match angler! Although a bit too out of the way (for me) for a weekly visit, if you are in that area I would seriously recommend that you call in and have a good look around. You will not be disappointed, although you will almost certainly leave a few quid lighter! Next story Trip #67 – Todber Manor – Whiteposts.